Ports of Call with Dates: Palma, Piraeus, Naples, Suda Bay, Cartagena, Barcelona and Gibraltar. Over 316 photos and the ships story told on 84 pages. 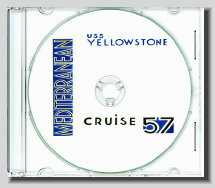 Once you view this CD you will know what life was like on this Destroyer Tender.